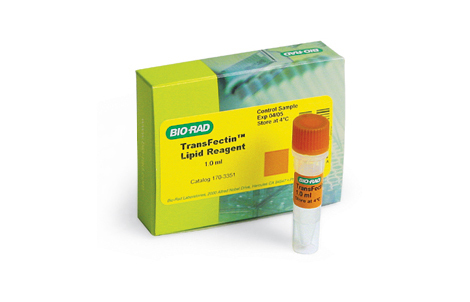 TransFectin reagent is a cationic lipid reagent that delivers the highest efficiencies and expression levels over a broad range of cell lines, including some difficult-to-transfect and primary cells, while minimizing damaging cytotoxic effects observed with other high-efficiency general transfection reagents. It provides high transfection efficiencies with lower amounts of lipid than most other lipid reagents, allowing more experiments per vial of reagent and lower costs per transfection. TransFectin lipid reagent is a mixture of a proprietary cationic compound and a co-lipid DOPE (1,2-dioleoyl-sn-glycero-3-phosphoethanolamine). These compounds have been optimized for intracellular delivery of nucleic acids into cultured mammalian cells in the presence of serum at cell densities from 40 to >90%. For most cell lines, high levels of expression can be obtained using concentrations of TransFectin reagent and DNA suggested for given sizes of plates/wells.